I stumbled across the Aero Milk Chocolate bar in a specialty store and um, I have a new favorite chocolate bar. These bars have a light chocolate bubble center that is not very sweet but oh so fun to eat. The bubble middle is covered by just the right amount of milk chocolate. The chocolate is not super sweet (which I like) and that bubble inside is just so, um, well.. light and fun. What I did find was an Aero Mint bar. Mint & I = a love hate combination. I enjoyed the mint M&M’s earlier this year but overall I avoid mint at all cost. 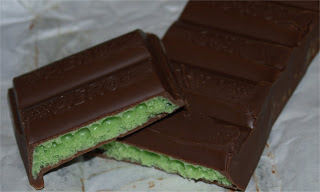 However, I did purchase the mint Aero bar but it took me about two weeks before I even tried it. When I finally did eat it, I was really quite pleased. The mint was not overpowering in the bar, really it was just the right amount. I really enjoyed the mint candy bar. I still prefer the milk chocolate version but in a pinch I would eat the mint bar again. You can find Aero bars at Whole Foods Market, World Market or any European specialty shop if you have one in your area. If you get the chance to try one, please let me know what you think. I think these are one of the most underrated bars in the Nestle Aero family. They're like nothing else - fresh and sweet and minty.